We make our slides for Class Time in PowerPoint. We combine subjects in our PowerPoint lessons; each Class Time day we have one PowerPoint for Language Arts and Social Studies and then another one for Math, Science, and Technology. We then load the PowerPoint into Blackboard Collaborate and voila – lesson time! During Class Time, the students have the opportunity to turn on their microphone and camera and share their thinking, show their work, or boast their dance moves during brain breaks. They also have access to a toolbar (which I turn on and off as needed). Their tools consist of stamping, drawing, typing, line drawing, and movable objects on the board. The students have access to some items all the time, like the ability to vote or give me a green check/red X, smiley faces, and the ability to raise their hand, to name a few. There is also a chat box in our virtual classroom that is open all the time. In Kindergarten, it is mostly parents communicating for them in the chat box or asking me questions. Keeping a 5-year-old engaged is a challenging task regardless of your setting! In the virtual setting, it can be even more challenging because you can’t see them unless their camera is on. I keep this in mind when planning lessons and try to make them as appealing as possible. Lots of interaction with the material can really help. The more the students are able to do (just like in a brick-and-mortar classroom), the more they will be engaged with the material. We also always take a brain break about halfway through each class so the students have the chance to stand up, get their wiggles out, and have some fun. And, as you may know, I love to use props. Hats, glasses, headbands (my personal favorite), and any other prop I can incorporate can help to keep my young learners focused on me. We do everything you’d see in a brick-and-mortar classroom. We read, write, do science experiments, dance, sing, do centers…you name it. The only difference is we are not physically together. The biggest challenges in the virtual Kindergarten classroom have to do with taking turns. When we are doing a whole-group activity, every student wants to do it and they sometimes have a hard time waiting for their turn at this age. But with practice, and activities like centers, they get better throughout the year with this. Also, there are some limitations in Blackboard that make turn-taking a challenge. For example, only six cameras can be on at one time. So, during a brain break, only six kids can show off their dance moves and that’s it. 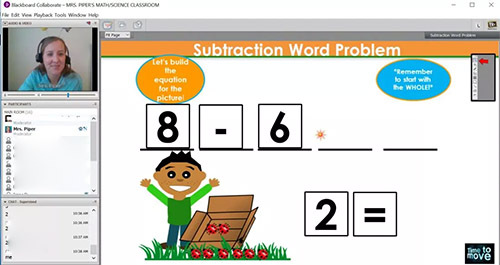 Something else that can be challenging at the Kindergarten level is the students need a lot of support in operating the tools and being successful in the virtual classroom. Most have their home educator sitting with them to assist during Class Time, but there are times when the home educator must step away. In this event, it is hard for the student to navigate the lessons alone, especially in the beginning of the year. Even though my students are 5 and 6, they do pick it up quickly and some can participate in Class Time independently by the end of the year. When I made the change from a brick-and-mortar classroom to my virtual classroom, I wasn’t really sure what this would look like. I’ve been pleasantly surprised to find that the only big difference is the platform: we are in a virtual room on the computer. But the kids, the teaching, the fun – that’s all the same. How do I help my student succeed? Class Time is a great opportunity to give elementary students (and parents!) the support they need to succeed. Being a home educator is a lot of work, but Class Time is a great way for students to connect and feel motivated. This entry was posted in Homeschool Edition, Parent Edition and tagged Elementary School Online, flvs class time, FLVS Elementary, Online Elementary School, virtual class time, Virtual Elementary School, Virtual Kindergarten teacher on February 15, 2019 by Cara Piper.